Repairs done right, the first time! The transmission is one of the most important parts of your car. Most people don’t realize that car manufactures suggest you service your transmission every 50,000 miles. 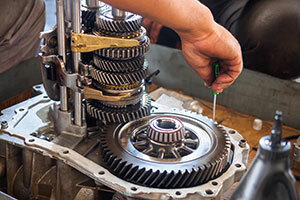 If you take care of your car’s transmission it will most likely run well and take care of you. The certified mechanics at Discount Brake Tune and Lube are experienced and know what they are looking for in a Phoenix transmission service or transmission repair. Whether you drive a vehicle with a five-speed manual transmission, or a vehicle featuring an automatic transmission design, our experienced and knowledgeable technical can help diagnose and repair the problem – all at a reasonable cost. Other auto shops offer unfair price gouging or outrageous rates for the repair of this vital vehicle component. At Discount Brake Tune and Lube Napa AutoCare Center, we guarantee a fair price in exchange for top-quality work – you won’t be disappointed! People know they should get their oil changed, but do you know the following items need to be routinely maintained for the best functionality of a transmission. Filter: All transmissions have a transmission filter to keep things clean. The staff at Discount Brake Tune and Lube is trained to diagnose and repair virtually any type of transmission system. You can contact our Phoenix car repair shop at (602) 667-3400. If you are located in Casa Grande, contact our Casa Grande car repair shop at (520) 426-1500.